A straggling desert plant, from a few inches to a foot and a half high, with smooth branching stems and smooth, very pale bluish-green leaves, rather thick in texture. The pretty flowers are from one to two inches across, white, tinged with pink or cream-color and a little yellow in the middle, often striped with magenta on the outside, and the bracts of the involucre tinged with pink and bordered with white. N. Californica is a branching plant, from one to five feet tall, with a stout stem and smooth oblcng leaves, lobed, toothed, or almost toothless, and quite pretty flowers at the ends of the branches. They are about an inch across, white, often tinged with magenta on the outside. This grows in California and Oregon, usually in shady or moist places. There are several kinds of Cichorium, natives of the Old World. The name is from the Arabic. 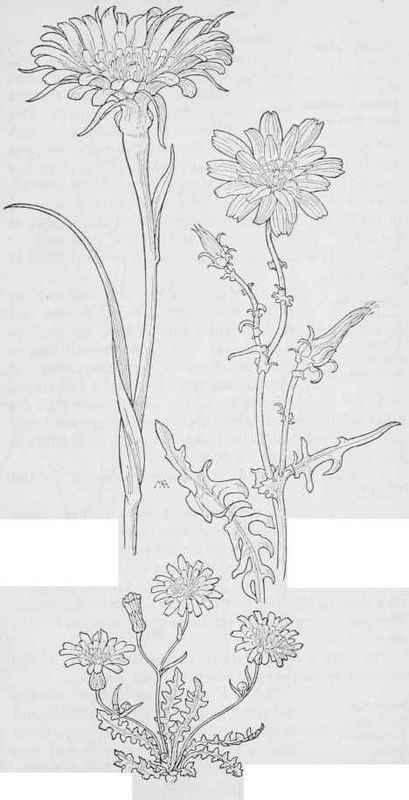 Salsify -Tragopogon porrifolius. Desert Dandelion- Malacothrix Fendleri. Desert Chicory Nemoseris. Neo-Mexicana. CHICORY FAMILY. Cicoriaceae.